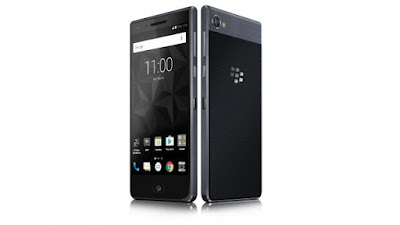 BlackBerry has introduced TCL-made BlackBerry Motion smartphone at the GITEX Technology Week in Dubai. It has a 5.5-inch 1080p display powered by an Octa-Core Snapdragon 625 Mobile platform with 4GB RAM and 64GB of Storage. It runs on Android 7.1 (Nougat) and has a water-resistant body with IP67 ratings. It has a 12-megapixel rear camera with dual-tone LED flash and an 8-megapixel front-facing camera. It has a customizable Smart Convenience Key, the fingerprint sensor on the home button with BlackBerry logo and a Locker Mode to keep your content safe. It features a hardened aluminum frame and soft-grip textured back. Connectivity Options include 4G LTE, Wi-Fi 802.11 ac (2.4 & 5 GHz), Bluetooth 4.2, GPS / GLONASS, NFC, USB Type-C Packed with a 4000mAh battery with support for Quick Charge 3.0 fast charging tech that lets you charge up to 50% in 40 minutes and promises over 32 hours of battery life with mixed use. BlackBerry Motion comes in Black color, is priced at Dh 1,699 (US$ 462) in UAE and 1,699 Riyal (US$ 453) in Saudi Arabia. It will be distributed by Axiom Telecom in the Middle East, and also available from Etisalat. It is available for pre-order from all leading retailers in the UAE and KSA starting today and will roll out in other markets later.